Menopause is an important time in a women's life. As menopause begins (anytime between the ages of 40 through 55), ovaries begin producing less estrogen, which in turn causes a variety of symptoms. If you are approaching menopause, we understand that you are uncertain about how these hormone changes will affect your life. Our doctors at Milwaukee Ob-Gyn are board certified in gynecology and can help you manage the signs and symptoms of menopause. Unfortunately, most women fear this change in their hormones. Not only do they worry that their lives will become an emotional roller coaster, but also having to deal with possible "hot flashes" or "night sweats" is also bothersome. 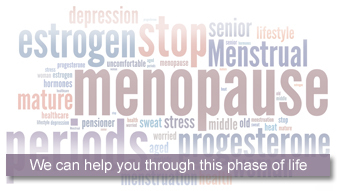 If you are experiencing menopause symptoms, make an appointment to talk with your doctor. Together we can determine which treatment is best for you.